Rome was not built in a day. In the same way a tower is not built as one piece and a pie is not made with one ingredient. We all have our own Rome’s to build, and it is important to realize that each one will be made up of bits and pieces; it is not one giant block that falls out of the sky and hits you on the head. So, here are a few of the bits and pieces that have been added to my Rome the last few weeks. I have been getting more consistent training with a few amateur sides in the area. So, at least a couple times a week I am able to get into a team training environment, which has been beneficial. The training level is of varying quality and in some cases the speed of play, and more particularly the speed of thought, is not as quick as I am used to. However, it is a good fitness boost and it is far more motivating to work at a training session than by yourself. The first team I have been involved with is called Thackley AFC. Thackley is just north of Bradford and about 8 miles from where I am staying. They are one division (I think it’s 9th overall) above the side I was playing with a little while ago: Albion Sports. So, it is an improvement in that sense. However, at the training sessions, not too many of the first team players come, since they often play twice a week. The sessions are thus typically filled with reserve/youth players and so they do lack a bit of quality. It is also difficult to judge the level of the first team from this point of view. However, the management staff have been friendly and have offered for me the opportunity to play some games. Once my paperwork goes through I look forward to be playing more competitively again – something I have sorely missed. I also trained with a team in the same division as Albion Sports called Yorkshire Amateur. They are based in the north suburb of Leeds. One of my relatives works with someone at the club and kindly got me in touch with him. He has been generous enough to let me come out to training. It is a similar situation to Thackley’s training with many of the first team players too busy to come, so many youth/reserve players make up the numbers, which in turn lowers the quality. Lastly, I was supposed to train with Guiseley AFC this week. The team down the road that I have watched and written about a few times. Their training session on Thursday evening; however, was called off. They ended up losing their FA Cup replay game to Barrow Town on Tuesday and the manager decided to rest the team before the weekend game, after the tough loss. Fortunately, I intend to train with them this Thursday instead, so God willing something will come of that opportunity as well. From all the accounts I’ve heard they are a well respected, well run club that would be a great, albeit difficult, place to get my foot in the door. I admit I have been to yet another Guiseley game. It was a cup game that they ended up winning 7-0 versus a lower division club, so it wasn’t much to write about. More of a slaughter-fest, although the visiting side did show some signs of a fight at first and could have made it interesting if they had scored one of their (few) early chances. Noteworthy; however, is the fact that it was after this game that I was finally able to speak with the manager and get invited to training (he must have just been very happy about his recent demolition job). My tour of non-league football (considered 5th division and below) continued and broadened this weekend as I went to a game about an hour away at the home of FC Halifax Town. If you were only to visit the stadium you would assume they were higher than the 6th tier of football, but that is the nature of the promotion/relegation system over here; where you can drop or rise consecutive leagues in consecutive seasons as fast as the temperature in Loretto, PA, where I went to school. FC Halifax Town, formerly Halifax Town AFC before entering administration in recent years, has a long history. They spent many decades in the football league, which partly answers the question of why they have a nice 13,000 capacity stadium. On the day, they handed the visitors, Droylsden FC, a solid 4-1 defeat. Although Droylsden are among the bottom dwellers, the “Shaymen” of FC Halifax made hard work of it and came into the half 0-0. Droylsden tried to keep the ball, but didn’t have the quality to do it effectively. Despite some average spells of possession, they were relatively harmless all game. FC Halifax ground out 2 goals in the first 30 minutes of the 2nd half before Droylsden answered with their only goal off of a well rehearsed free kick play. While Droylsden pushed on for the equalizer, FC Halifax duly killed the game with 2 goals in the last 10 minutes. The crowd, numbering around 1300, was not afraid to show it’s disapproval at it’s own players and were probably the least forgiving crowd I’ve seen. Although, to be fair to them, it wasn’t a pretty spectacle for much of the game. Walking up to the Shay’s main stand. The East Stand of the Shay – empty for today’s game, but doubled well as an advertising space. 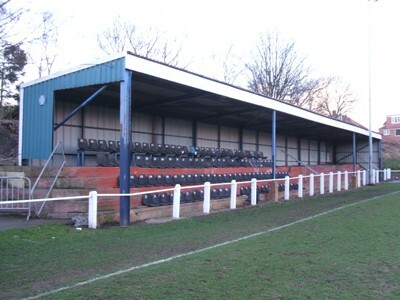 The Shay – home of FC Halifax Town – this looks to be an older stand and was empty on the day. All these situations are good building blocks for me and I am sure they will be integral in helping me to the next step in the process for a couple of reasons. The most obvious benefit is fitness. At any training session, no matter what the level, you can be sure that there is one constant where fitness is involved: you get in what you put out. So, I always put in a good shift on that front. Also, it is a great chance to network and continue to learn about the sports environment I am in, which is very interesting and unique to anything we see in the US. The more I get acquainted with English football, the more impressed I am with the sheer number of football grounds there are here. 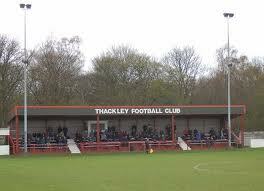 Even at the lower levels, like Thackley and Yorskshire, clubs have their own dedicated ground. Sometimes it’s not huge and barely has a stand, but it is still impressive and just goes to show how integral football is to the culture here. It is also interesting that many of the clubs here, small and large, have a long and storied history, often even from before the world wars. Stay posted on the future developments of my Rome and keep on building yours, we’ll get there. Your great grandfather Hillam would be very proud of you Sean. As is the rest of the family. Happy Thanksgiving! Thanks Uncle James! He and the whole family are a constant influence and source of support and inspiration for me. Happy Thanksgiving to you as well.